Sailing is one of the most exhilarating hobbies you can pursue, but many people put it off, because they believe learning how to do it is too complicated. While it’s true that there is much to learn, there are courses, programs, and tips that can make the educational process both beneficial and enjoyable. There isn’t any one right way to learn how to sail. There are many ways to get started and you should look for the method that feels right to you. While classroom learning may appeal to you, others may choose to take a more hands-on approach. Whatever your choice, the important thing is to learn as much as you can and to have fun while doing it. There are varying degrees of virtual learning from a single 30-45 minute orientation to longer courses that may last several weeks. Even a brief course can teach you valuable information, such as sailing terms, the anatomy of your boat, and general safety skills. Most courses can also help you identify the most important items to have aboard your vessel for dealing with emergencies, such as injuries or vessel damage. Information for sailing clinics can be found at most boat shows and are conducted on the water, providing hands-on sailing lessons. 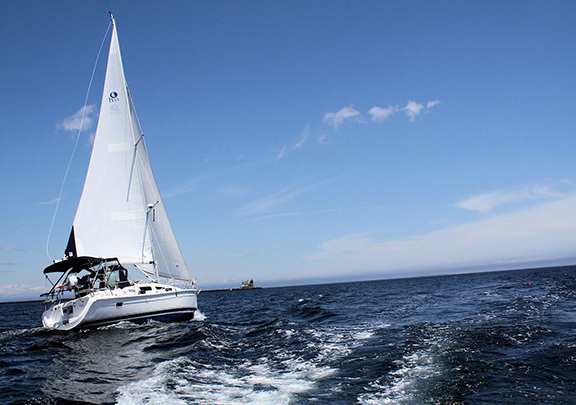 Clinics offered by the ASA (American Sailing Association) vary in skill level from beginner to expert, teaching the necessary skills to operate and maneuver all types of sailing vessels. Certified instructors conduct the lessons, ensuring a positive learning experience. For a more intensive training experience, you might want to look for sailing schools in your area. Typically, this will involve a longer curriculum that combines classroom learning with practical experiences. Depending on the school, you’ll likely be able to train on a few different types of vessels and learn more advanced techniques that will prove useful, once you’re on your own. Instead of opting for a full program, you might choose to just take one introductory course. This will let you get a feel for the experience, before you commit to pursuing sailing more fully. This type of course will provide enough education and experience to qualify you for sailing a smaller vessel and will introduce you to practices that will ultimately lead you to becoming a more advanced sailor. There are a few pointers that expert sailors often pass on to the inexperienced to help them become better at their craft. Like anything, practice improves performance, but continuing to make the same mistakes inhibits the learning process. By considering these tips, you can improve your performance as a sailor. Time and Distance – One of the most important factors in managing your vessel is getting an understanding for how it handles in relation to its size. Repeating a brief rolling sequence can help you work out the kinks and get a feel for how the boat handles. Momentum – Your speed can easily get away from you, even after you have acclimated to the vessel’s size and maneuverability. If you’re competing in a race or find yourself among other boats, an uncontrolled momentum can lead to falling behind or failing to maintain a good showing, or it may cause you to advance too quickly. When in that situation, a good measure is to stay equal to the leeward boat, or trail just behind it. This will help you keep a tighter rein on your speed by giving you a point of reference. Routine – Depending on the size of your boat, you may need a crew to help you operate it on the water. By developing a standard routine, you can get everyone working in unison, ensuring that everyone knows just what is expected. Establishing this type of routine can help everyone feel comfortable with their roles, so they’re less likely to make a mistake born of anxiety or confusion. If your crew is also comprised of novices, such as friends or family members, this tip may be especially useful. Practice – As with any new activity, the key to becoming good is to continually practice and work to hone your craft. Whether you want to sail in competition or just for leisure, you’ll want to improve your performance and the best way to do that is to get out on the water as much as possible. Choosing sailing as hobby can lead to memorable experiences and provide a great way to get away from the stresses of city living. While getting started may seem intimidating, once you learn the basics and get some experience under your belt, many of your fears and apprehensions will disappear. You’ll discover an exciting new world and the freedom to explore it on the waves.